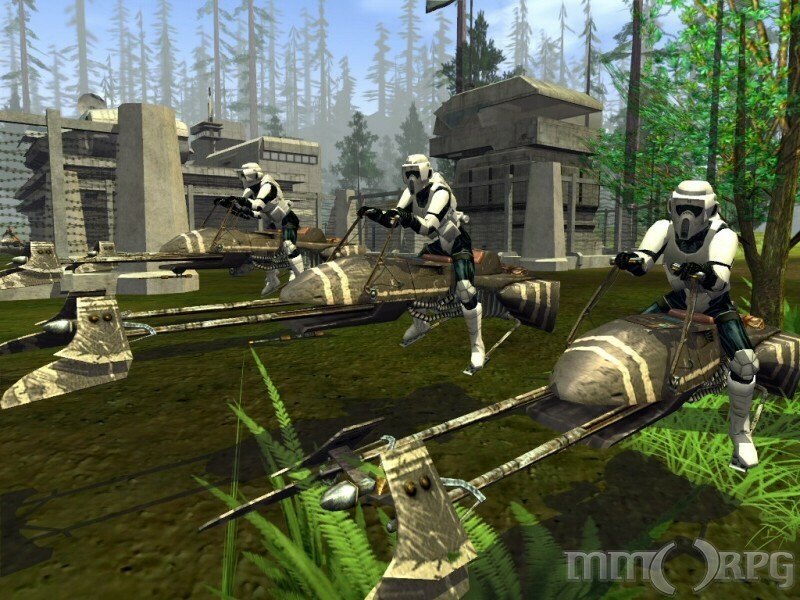 \'Experience The Greatest Saga Ever Told - Yours.\' In Star Wars Galaxies you create your role in the Star Wars universe along with thousands of players per galaxy (server). You build your skills to advance in your chosen profession(s), play part in the Galactic War against the Rebellion and the Empire, be employed to deliver goods or destroy your employers enemy, and more. You can play 6 basic roles of Artisan, Marksman, Entertainer, Brawler, Medic, or Scout. After training in these professions you can gain special roles that utilize your skills. If you are force-sensitive you can even become a Jedi. The graphical effects are amazing. There are fireworks which look spectacular, the water is very realistic, explosives are practically perfected, and the world effects are almost exact to real physics. There are several animations to experiment with. There are several facial expressions, body movements and NPC animation. The lighting is perfected to real-world physics. When it\'s night its dark but not too dark, when it\'s day its bright but just right. The lighting could practically not get any better. The planets are fairly large, and it would take hours to possibly days to hike through one. The world sizes are however accurate. In the towns you have several buildings which look like they are from the movies. The worlds look very realistic to the Star Wars universe. Sure there is going to be bugs every now and then, it is human made, and it is a MMORPG. This game gets updated about once to twice a week and bugs are eliminated and new features added. The game is decent when it comes to appropriate content. Only thing I would have to disagree with is the exotic dancing, the semi-exposing clothing that can be worn and that you can attack other players and NPCs for items, money, meat, bones, and hide. But these are features that add on to the Star Wars feeling. You ask me, Is it worth the money to pay $50 plus the monthly fee? I would say yes, the $50 goes towards the software and paying the publisher mainly, and the game is a great game. Now you say well the monthly fee is ridiculous. It may be ridiculous if you don\'t know the reason behind it. The monthly fee goes to pay the developers, and the support team, and it also goes towards paying maintenance for the servers.